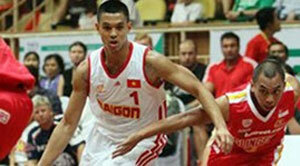 VietNamNet Bridge – Despite beating Malaysia Dragons 89-78, Vietnam’s Saigon Heat basketball team was disqualified from the ASEAN Basketball League (ABL) Championship in Ho Chi Minh City on May 19. At the start this season, Saigon Heat got off well with three wins out of four matches. However, it couldn’t maintain its good performance after some key players had injuries. By far they have been beaten in 17 out of 22 matches, and have to say goodbye to the championship. Four teams qualified for the semi-finals are the Philippines’ San Miguel Beermen, Indonesia Warriors, Malaysia Dragons and Thailand Slammers. Two losers are Singapore Slingers and Saigon Heat.